Many employers and individuals support mindful meditation for the numerous health benefits it is believed to yield practitioners, including reducing stress and improving critical thinking. Since digital and online platforms allow mindful meditation to be practiced by the masses, they have risen in popularity and often are implemented in employee wellness programs. A study published BMC Psychology calls into question the efficacy of meditation technologies. To reach its conclusion, the study researched outcomes of 91 students who were asked to log into sessions on a smartphone or mobile application over a six-week period. 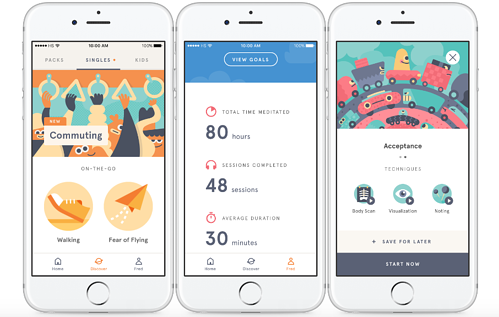 Both groups used the popular mindful meditation app Headspace and were asked to complete 30 10-minute sessions whenever it was best for them. The intervention group was introduced to the concept of mindfulness, provided practical tips for meditation, as well as other techniques such as body-scan meditation, breath counting exercise, etc. The control group, on the other hand, were given instructions about guided breathing and were invited to sit with their eyes closed. The exercises were called meditation, but the participants weren’t guided on how to control their awareness of their body or breath. This was the “sham” app. Researchers collected baseline data a week before and after the intervention. Primary outcome measures assessed mindfulness, executive functioning, critical thinking, actively open-minded thinking, and need for cognition, and secondary outcome measures assessed wellbeing, positive and negative affect, and real-world outcomes. The study found “significant increases in mindfulness dispositions and critical thinking scores…in both the mindfulness meditation and sham meditation groups. However, no significant effects of group allocation were observed for either primary or secondary measures.” The researchers did caution that additional research is required, and employers should take into consideration that this study did focus on students (the median age of participants was just under 21). That being said, the results should at least have organizations and individuals alike reconsider the practice of mindful meditation. They should also think about what they want to gain from their mindful meditation program. This study specifically was looking at the impact on critical thinking, and if that is the primary goal of the practitioner, there is even more reason to reevaluate meditation.